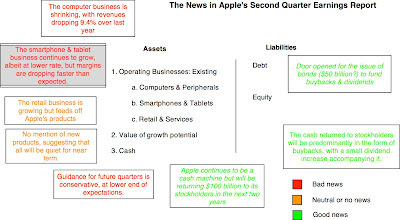 As has been the case for much of the last two years, the Apple earnings report on April 24, 2013 was a media event, previewed endlessly on investment sites, covered heavily by the media and tweeted about by both Apple fans and foes. While I try to stay away from the hype around earnings reports, this is a good occasion to revisit my earlier posts on Apple, and especially the one I made at the start of this year on its valuation. There is nothing surprising about this balance sheet but it brings together much of what has happened to the company between April 2012 and April 2013. During the year, the company has become increasingly dependent upon its smartphone business, accounting for 60% of revenues and even more of operating income, generating immense amounts of cash for the company (with the cash balance climbing $50 billion over the course of the year to hit $145 billion). During the course of the year, we have seen a slowing of revenue growth and pressure on margins, both of which have contributed to declining stock prices. The other big change over the course of the year is that the value of growth potential (from unspecified future products) has faded, at least in the market’s eyes, and this is reflected in the decline of $200 billion in market value over the last nine months. First, in the no news category, revenue growth is no longer in the double digits and smartphones continue to increase their share of overall revenues & operating income. Well, we knew that already and the revenue growth was well within the expected bounds. Second, the bad news is that margins are shrinking faster than we expected them to, though I get the sense that Apple is understating its margins (by moving some expenses forward) and its guidance for the future with the intent of getting ahead of the expectations game. Third, in near term bad news, the fact there is no mention of any new products or breakthroughs suggests that there will be no revolutionary product announcement (iWatch, iTV, iWhatever) in the next quarter. However, if you are a long term investor, it is mildly disappointing that it looks like that there will be no blockbuster announcements in the next three months but it is clearly not the end of the world. On the financial side, there was substantial news, much of which I think is positive. Cash return to stockholders: The decision to decision to return about $100 billion more in cash to stockholders in buybacks and dividends by 2015 has to be viewed as vindication for those (like David Einhorn) who have arguing that Apple should be explicit about its future plans for cash and that it should distribute a large chunk cash with stockholders. Buybacks versus Dividends: In a bit of a surprise, the cash return will be more in the form of buybacks than dividends. I, for one, am on board with that decision because hiking the dividends further will essentially make this stock a "dividend" play, with an investor base that will put dividend growth in the future ahead of all other considerations. If Apple wants to retain the option of entering a new and perhaps more capital intensive business in the future, it is better positioned as a consequence of this decision. Debt coming? In an even bigger surprise, Apple has opened the door to taking on conventional debt. While the details are still fuzzy and the initial bond issue may be for only about $10 billion, it seems likely that the debt issued will grow beyond that amount. To those who would take issue with this decision, arguing that Apple does not need to borrow with all of its cash reserves, you may be missing the reason why this debt will add to value. If the trade off on debt is that you weigh the tax benefits of debt against the bankruptcy cost, there can be no arguing against the fact that borrowing money will add value for stockholders. To those who feel that it is in some way immoral or unethical, based upon the argument that Apple is sheltering its foreign income from additional US taxes while claiming a tax deduction for interest expenses, I would be more inclined to listen to you if you showed me convincing proof that you make mortgage interest payments every year but did not claim the mortgage tax deduction in your tax returns, because you think that it deprives the treasury of much needed revenue. The US tax code is an abomination, with its treatment of foreign income as exhibit 1, but to ask Apple (and its stockholders) to pay the price for the tax code's failures makes little sense to me. In summary, the net effect of the earnings report is negative on operating cash flows (with the declining margins) but positive on the financial side (with any discount on cash dissipating, as a result of the cash return announcement, and the tax benefits from debt augmenting value). Revenue growth: As the competition in the smartphone business continues to increase, I am inclined to lower my expected revenue growth rate for the next 5 years to 5% from my original estimate of 6%. While this is well below the revenue growth of 11.28% over the last year (even using the last 'bad" quarter comparison to the same quarter the previous year), it is the prudent call to make, especially in the absence of news about new products in the near term. Operating margin: I had projected a target pre-tax operating margin of 30% in my December 31, 2012, valuation, about 5% below the prevailing margin of 35.30% from the last annual report (the 10K in September). The pre-tax operating margin has dropped to 30.92% in the trailing 12 months ending March 31, 2012, and was about 29%, just in the last quarter. Since margins are coming down faster than expected, I lowered my target margin to 25%. Cost of capital: The cost of capital that I had used in my December 2012 valuation was 12.49% reflecting my expectation that Apple would stay an all equity funded firm in the foreseeable future. The decision to use debt upends that process and adding $50 billion in debt to the capital structure, while buying back $50 billion in stock raises the debt ratio in the cost of capital calculation to about 13%, while lowering the cost of capital to about 11.29%. If you are concerned about whether borrowing $50 billion will put Apple in danger of being over levered, I did make an assessment of how much debt Apple could borrow, by looking at the effects of the added debt on the costs of equity, debt and capital, with the objective being a lower cost of capital. I try to be realistic in my estimates of cost of equity (adjusting it upwards as a company borrows more) and the cost of debt (by coming up with a prospective rating at each dollar debt level and cost of debt at each debt ratio). If Apple can maintain its existing operating income, its debt capacity is huge ($200 billion plus) but even allowing for a halving of their operating income, it has debt capacity in excess of $100 billion. As with the valuation spreadsheet, you are welcome to download my capital structure spreadsheet for Apple and play with they numbers. Given the price collapse over the last few months, it would be foolhardy not to stress test the numbers in this valuation. In the first set of tests, I went back to the discounted cash flow valuation and computed my break even numbers for growth, operating margins and cost of capital, changing each of these variables, holding all else constant. The table below lists the current numbers for Apple for these variables, my estimates and the break even that yields today's stock price ($420 on April 28, 2013). Holding all else constant, Apple's revenues would have to decline 5% a year for the next 5 years to justify a value per share of $420. Similarly, the pre-tax operating margin would have to drop to 12% from 30% today, holding the other variables at base case levels, to get to the same price. As an investor in Apple, there seems to be plenty of buffer built in, at least at current stock prices. Will Apple go the way of Dell and Microsoft? As a technology firm, though, your concerns may be about the company hitting a cliff and essentially either losing value or becoming a value trap. In particular, you may be worried that Apple may follow in the footsteps of two technology giants that have had trouble delivering value to stockholders in the last decade. One is Dell Computers, where Michael Dell's attempts to rediscover growth have failed and the company is now facing a more levered, low growth future. The other is Microsoft, a less dire case, but a stock that hit its peak about a decade ago and has plateaued since. Can Apple be "Delled" or "Microsofted"? To be Delled: What awaits a company when it's product/service becomes a commodity and it operates at a cost disadvantage. Dell was an success story in the growing PC business through much of the late 1990s and the early part of the last decade. As the market for PCs grew, Dell used its cost advantages over Compaq, IBM and HP to make itself the most profitable player in the market. What's changed? First, the market for PCs hit a growth wall, as consumers turned to tablets and other connected devices. Second, PCs became a commodity, just as Dell lost its cost advantage to Lenovo and other lower cost manufacturers. With Apple, the peril is that their biggest and most profitable business, smartphones, may be heading in that direction. Unlike Dell, though, Apple is more than a hardware manufacturer and it's success at premium pricing in the PC business is indicative of the pricing power that comes from creating the operating system that runs the hardware. I believe that the risk of Apple being Delled is small. To be Microsofted: The destiny of a business that has a profitable, cash-cow product(s) but runs low on imagination/creativity. Riding the success of Windows and Office, Microsoft became the largest market cap company about a decade ago. Like Apple, it seemed unstoppable. So, what happened? From the market's perspective, the company seemed to run out of imagination and creativity and investors got tired of waiting for the next big hit and moved on. Note, though, that while the stock price and market capitalization have not moved much over the last ten years, the company has returned billions in cash to its stockholders. 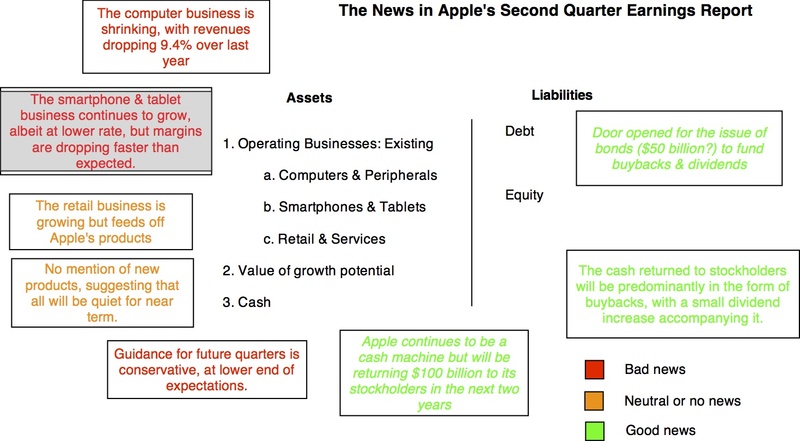 Could this value stagnation happen to Apple? Yes, but to me (and I have never been shy about my Apple bias), there are is a big difference between the companies. One is that I don't think that Microsoft lost its imagination and creative impulses a decade ago. I don't think it ever had any. While Windows nor Office were workmanlike and professional products, neither can ever be called elegant or creative (and I speak as a heavy user of Office products). Apple, on the other hand, has created iconic products through the decades, some less successful than others (remember the Newton), and I find it hard to believe that those creative juices just dried up last September. Buy or Sell? Hold or Fold? If Apple was being priced as a high growth stock, with sustained margins and on the expectations of "big" new hits in the future, I would be worried about the last earnings report. It is not. As you can see from the break even table in the last section, it is being priced as a low growth, declining margin company, with no great hits to come. I find it striking that the same investors who have priced the stock on this basis react to incremental news on these items (growth, margins, new products), as if they had not already priced it in. Paraphrasing Winston Churchill, gold is a "riddle, wrapped up in a mystery inside an enigma", at least as far as I am concerned. I don't understand what moves the gold price and I have never held gold in my portfolio. That does not mean, however, that I am not fascinated by the price of gold and immune from its movements. That was brought home last week, when the price of gold dropped by 9% on April 15, 2013, the biggest one day drop in thirty years. Not only did the prices of other precious metals (silver dropped 12%) and industrial metals drop, but stock prices took a tumble as well. While the attention has focused on the price drop in recent days, gold has had a good run over the last decade. 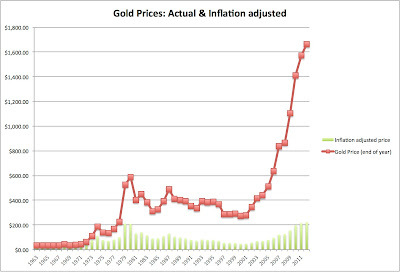 The nominal and inflation-adjusted prices of gold have soared in the last decade, and at the end of 2012, the nominal price was at an all time high of 1664 and the inflation-adjusted price was close to its previous high set at the end of the 1970s. The big question that has been debated in recent days is whether gold will continue to drop in the coming days. More generally, is gold is under or over priced? With my limited understanding of gold, I decided to give it a shot. Does gold have an intrinsic or fundamental value? The intrinsic value of an asset is a function of its expected cash flows, growth and risk. Since gold is a non cash-flow generating asset, I argued in this earlier blog post that you cannot estimate an intrinsic value for gold. It is the same argument I would make about all collectibles: Picassos, baseball cards or Tiffany lamps included. If one of the central tenets of value investing is that you should never invest in an asset without estimating its value, that would seem to rule out gold as an investment for a classic value investor. In fact, Warren Buffett has repeatedly argued against investing in gold because it's value cannot be estimated. There is an alternate route that can be used to estimate the "fundamental" value of a commodity by gauging the demand for the commodity (based on its uses) and the supply. While that may work, at least in principle, for industrial commodities, it is tough to put into practice with precious metals in general, and gold, in particular, because the demand is not driven primarily by practical uses. If gold does not have an intrinsic value, what is it that drives its value? 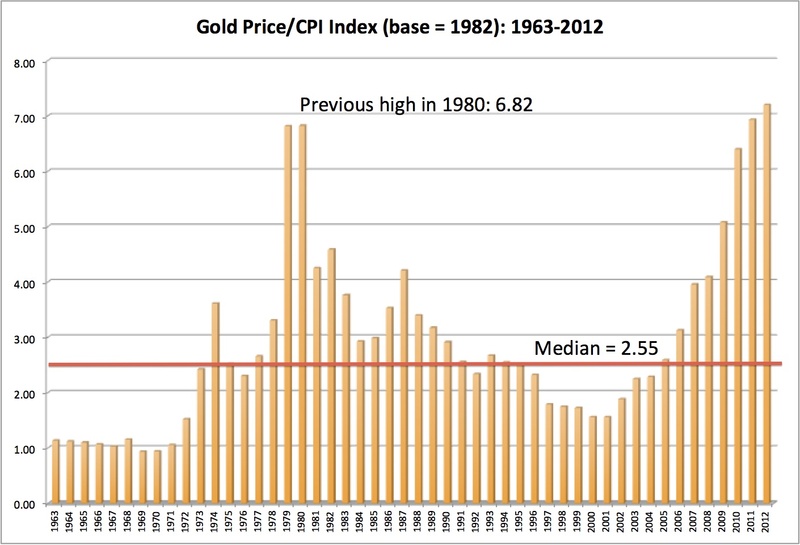 There are at least three factors historically that have influenced the price of gold. 1. Inflation: If as is commonly argued, gold is an alternative to paper currency, you can argue that the price of gold will be determined by how much trust individuals have in paper currency. Thus, it is widely believed that if the value of paper currency is debased by inflation, gold will gain in value. To see if the widely held view of gold as a hedge against inflation has a basis, I looked at changes in gold prices and the inflation rate each year from 1963-2012. 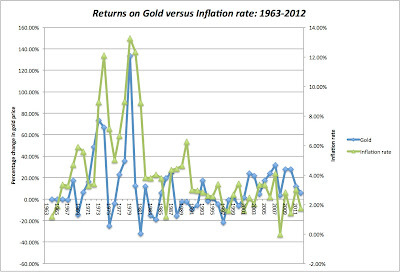 While this regression does back the conventional view of gold as an inflation hedge, there are two potential weak spots. The first is that the R-squared is only 20%, suggesting that factors other than inflation have a significant effect on gold prices. The second is that removing the 1970s essentially removes much of the significance from this regression. In fact, while the large move in gold prices in the 1970s can be explained by unexpectedly high inflation during the decade, the rise of oil prices between 2001 and 2012 cannot be attributed to inflation. 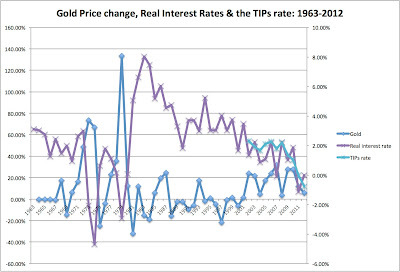 In fact, taking a closer look at the data, it is clear that gold is more a hedge against extreme (and unexpected) movements in inflation and does not really provide much protection against smaller inflation changes. 2. Fear of crisis: Through the centuries, gold has been the “asset” of last resort for investors fleeing a crisis. Thus, as investor fears ebb and flow, gold prices should go up and down. To test this effect, we used two forward-looking measures of investor fears – the default spread on a Baa rated bond and the implied equity risk premium (which is a forward looking premium, computed based upon stock prices and expected cash flows). As investor fears increase, you should expect to see these premiums in both the equity and the bond market increase. 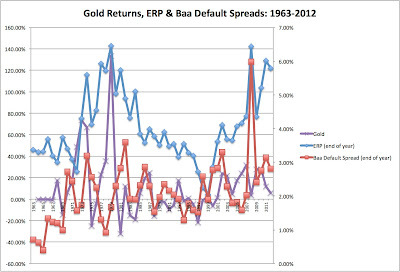 These regressions suggest little or no relationship between bond default spreads and gold prices, but a positive relationship, albeit one with substantial noise, between gold prices and equity risk premiums. Thus, gold prices seem to move more with fear in the equity markets than with concerns in the bond market. Every 1% increase in the equity risk premium translates into an increase of 8.91% in gold prices. 3. Real interest rates: One of the costs of holding gold is that while you hold it, you lose the return you could have made investing it in a financial asset. The magnitude of this opportunity cost is captured by the real interest rate, with higher real interest rates translating into much higher opportunity costs and thus lower prices for gold. The real interest rate can be measured directly used the inflation indexed treasury bond (TIPs) rate or indirectly by netting out the expected inflation from a nominal risk free (or close to risk free) rate. High real interest rates are negative for gold prices and low real interest rates, or negative real interest rates as is the case today, push gold prices higher. Knowing that gold prices move with inflation, equity risk premiums and real interest rates is useful but it still does not help us answer the fundamental question of whether gold prices today are too high or low. Can you do a relative valuation of gold? I don’t know but I am going to try. 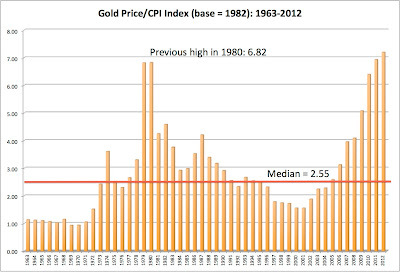 At the year-end price in December 2012, gold prices were at an all time high, relative to the CPI. Updating the gold price to 1382.2/oz, the price on April 17, yields a Gold/CPI ratio of 5.98. While gold remains over priced, relative to historic norms, it looks far less over priced once we account for today's risk premiums. 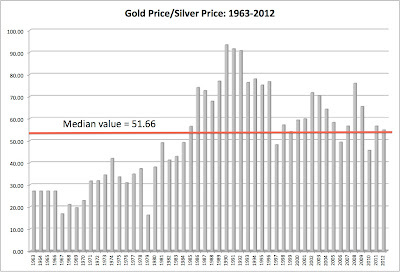 The median value of 51.22 over the 1963-2012 period would suggest that gold is not over priced, relative to silver. 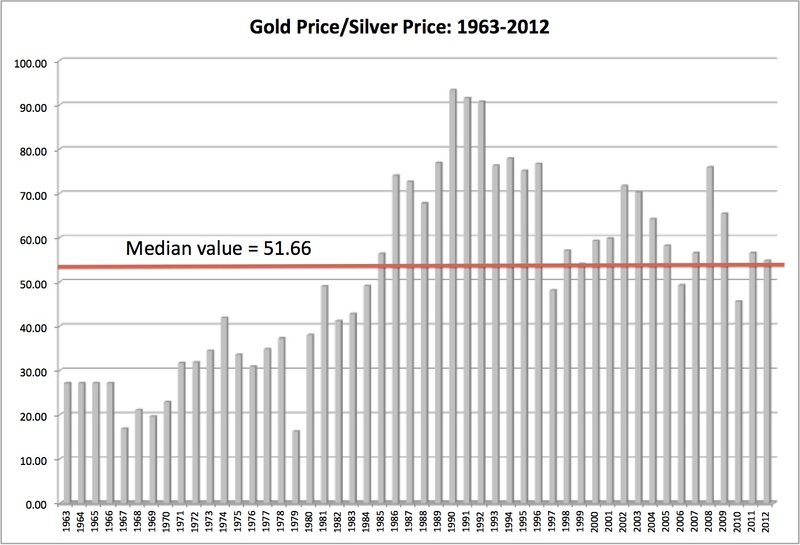 In fact, silver has dropped in price more than gold has this year and using the April 17, 2012 prices for gold (1382.2) and silver (23.31), we get a ratio of 59.30. Given that gold and silver move together more often than they move in opposite directions, I am not sure that this relationship can be mined to address the question of whether gold is fairly priced today, but it can still be the basis for trading across precious metals. 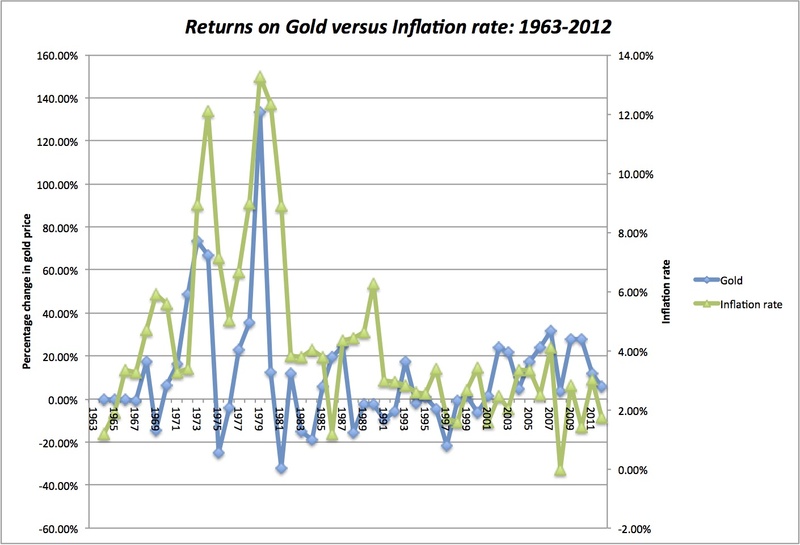 You should not expect to gold to generate high annual returns over long periods. In fact, notwithstanding boom periods (the 1970s and the last decade) gold has, for the most part, generated low returns over long periods, relative to other risky investments. It also follows that the price of gold should reflect the cost of buying the insurance, which in turn will be driven by the uncertainty you feel about the future and the likelihood of catastrophic events. Thus, the multiple crises over the last decade (banking, war, terrorism) explain both the surge in gold prices over the last decade and the correlation with equity risk premiums. It is worth noting that gold is not the only insurance against black swan events. There eare other ways, using other real assets (collectibles, real estate, other commodities) or financial derivatives (including puts on indices) that can deliver the same hedging results, perhaps at a lower cost. I have always been uncomfortable talking about the value of gold as an asset and its place in my portfolio. Writing this post has been cathartic, since it has allowed me to recognize the two sources of my discomfort. First, I am most comfortable with cash flow generating investments, where I can estimate an intrinsic value, and my valuation tool kit is limited when it comes to valuing gold. Second, I don't share the fervor that some investors have for gold, who seem to view it as much in emotional terms as in financial ones. As a complete novice in assessing the value of gold, here is how I see its value. As a stand-alone investment, I would not buy gold, given its history (of delivering low returns in the long term) and given how it is priced today. As insurance, though, I think it makes sense to add to your portfolio, even at today's prices. You don't have to be a conspiracy theorist or paranoid about central banks to have legitimate fears that prices in financial markets, built upon uncommonly low interest rates, may collapse. I know that the price of gold as insurance is higher than it has been in the past, but the risks that you are insuring against are also much higher than they have been historically. Update: If you are interested in exploring the data on your own, you can download the raw data on gold prices, silver prices, CPI, interest rates, ERP and other variables.